Title page and illustration from A Narrative of the Captivity, Sufferings, and Removes of Mrs. Mary Rowlandson,Boston: John Boyle, 1773. 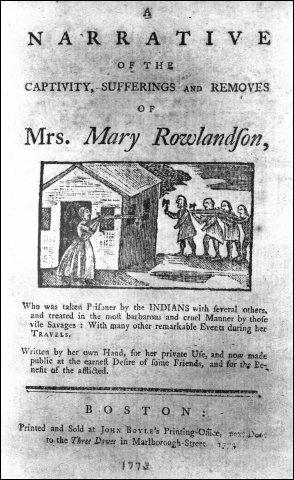 Mary Rowlandson's captivity narrative, first published in 1682, was reprinted and reedited throughout the eighteenth and nineteenth centuries. The book was especially popular during times of national crisis. It is a classic example of Puritan prose style and method.